The bride is at the very centre of everybody’s attention during the ceremony. The bride usually wears a white dress or of similar colour, in recognition of her purity. The bride should be the only person having a white dress on. Wearing something green, however, is thought to bring good fortune. 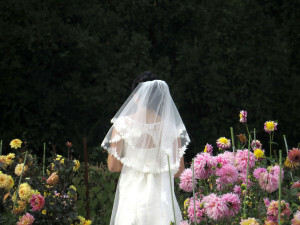 Superstition leads the bride to hide her face from evil spirits with the bridal veil. Actually, the veil symbolizes virginity, as if the bride never met a man before. Historically, the veil is thought to having been introduced to avoid grooms refusing to accept their never-met-before-bride as spouse at the time when weddings were planned by bride and groom’s families. The bride must spend the night before the wedding at her parent’s house to avoid the groom’s seeing the wedding dress: This is said to bring bad luck. For the very same reason, on the day of the wedding, the bride should avoid wearing any gold until the wedding ring has been presented to her. The traditional saying “wet bride, lucky bride” is used on a wet wedding day to either console the newly weds for the rain and clear the horizon of any ominous omen for their future or as a best wish for the marriage to be fertile (as bride and land are often associated). The groom’s traditional dress is usually a morning dress (“tight”) whereas the dinner suit (“smoking”) should be avoided, being a vesture best used for nights out to theatre or to other formal events. 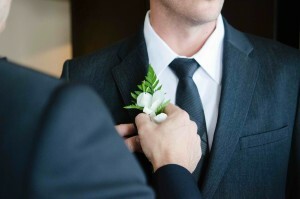 Today’s grooms choose a classic dress, gray or blue, a vest, a white shirt, a nice tie and black shoes. In Catholic weddings, the groom stands at the altar with his witness(es) and awaits the bride to step in accompanied by her father who will then “let her go away” from him. The bride’s father shakes the groom’s hand, kisses her daughter and walks back to the first raw of benches to take place next to his spouse. In some regions, bride and groom walk together to the church, and the groom carries a piece of iron in his pocket to ward off the evil eye. In Civil weddings, bride and groom arrive together to the wedding hall accompanied by family and friends. In Northern regions, local tradition holds that the groom is in charge of bringing the bride’s flower bouquet to the wedding as his last gift as fiancée. Elsewhere, colour and style of the bouquet is meant to be a surprise for the bride and it also signifies a present from the groom’s family to the bride. The groom who forgets something on his way to church should never go back on his own steps: It would mean he’s thinking of giving up the marriage. That is why he should always be with a friend or his witness. At the end of the wedding ceremony, the groom may donate an ear of wheat to his spouse to symbolize land and fertility again. These are sent to all those who want to be present at the ceremony in the church or in the Municipality. These are only for participants in the wedding banquet. Generally a quantity of cards greater than the first count is ordered to avoid the risk of having to do a reprint the last minute. However, tradition has it that the cards are written with fountain pen in black ink on white or ivory paper. It is usually the bride and groom themselves who announce the wedding, but on certain occasions, these are the parents of the bride and groom who do so. The first solution is more common, whereas the second is the one suggested by etiquette and often used in case a very young couple is getting married. Cards should be delivered one or two months before the wedding day (and in any case not later than six weeks) in an open envelope with the address written in beautiful hand-written calligraphy. The etiquette also suggests to create, in the same paper and printing of invitations, small paper tags with the names of the couple to be enclosed to candied almonds that will be distributed to invitees after the banquet. After the wedding is finished, sending thank you cards is absolutely mandatory. These emphasize the bride and groom’s appreciation and joy in having had the guests joining their celebrations. The etiquette states that thank you envelopes and cards should have the same style as the invitations and be strictly hand-written, bringing a personal phrase, perhaps related directly to the gift received. There is no specific time to convey them, but no later than one month after returning from honeymoon. It is no wonder that Italy has long been a world favourite honeymoon destination for centuries. We have no doubt that Italy’s beautiful scenery, renowned food and wines, unbelievable history and culture will seduce you as well! 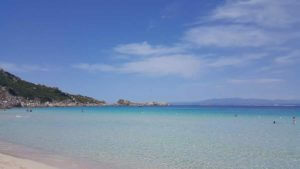 Have a look at some of the Italian honeymoon top-destinations we list here for you, and start dreaming! Sorrento, Positano, Amalfi and Ravello are some of the most famous villages of the Amalfi Coast, a wonderful stretch of land rising straight from the sea with spectacular views over the shoreline and the blue Mediterranean waters. Ravello is a small resort up on the hill that Richard Wagner described as … the closest place to heaven! Venice is the legendary city on water, a true, magic gem that will take you back in time with its canals and unique setting. An enchanting city for lovers that everyone must visit once in their lifetime! Nested among lush wooded mountain, scattered with majestic villas, beautiful gardens and small lakeside towns, lake Como will take your breath away. Lake Como is an ideal place for your tranquillity and romance. Florence is the “jewel in the crown of the Renaissance”, a romantic city that will overwhelm your emotions with its amazing architecture, art and history. Tuscany is so rich in picturesque towns and rural scenery, you will find yourself wondering why not everybody come here for their honeymoon: Lucca, San Gimignano, Siena, Montalcino, Montepulciano, Pienza, Chianti, Cortona … the choice is yours. Rome, the Eternal City, is one of the most popular tourist destinations in the world. Although definitely a hustling capital, a honeymoon amongst its masterpieces of art and monuments will be definitely remembered as unforgettable. Umbria is the green heart of Italy, ideally located between Tuscany and Rome. A honeymoon here means peaceful and diverse countryside, stunning cuisine, as well as an incredible architecture and art within its medieval towns: Orvieto, Perugia, Assisi, Todi, Spoleto, Bevagna and many more. The “Italian Riviera” is the beautiful coast of Liguria, speckled with tint houses, shores, tiny harbours and fishing villages. Picturesque Portofino, gracious Santa Margherita Ligure along with many other villages on a stretch of eighteen rugged kilometres of the riviera renowned as Cinque Terre are ideal destinations for a relaxing honeymoon, blessed with the sun, the unique character of each village and the warmth of the people. The wedding cake is an essential element of choreography and tradition at the end of a wedding reception: whether it be a banquet, a buffet or a refreshment, these must necessarily be closed with the arrival of the wedding cake. Choosing the wedding cake is not a simple undertaking. On the cutting of the cake focuses the attention of all the guests and the pictures of your cake will be the album’s most beautiful day of your life. Tradition has it that the entire cake is brought in the wedding banquet room among the enthusiasm of those present and that the bride and groom, immortalized by the photographer of the wedding, cut the first slice. The bride should grip the knife with your right hand, while the groom will put his over hers. They will then let the waiters cut and serve the rest to all guests: the bride and groom will be served first. Every detail on the big day should be carefully defined. The choice of the cake is no exception and it should be done in harmony with the environment and the style of your wedding reception. Whether that is the traditional multi-storey cake, topped with the sugary bride and groom, rich creams and decorations, a puff, a mountain of Profitteroles, a mimosa or a tart with berries depends primarily on your taste but also on the season, place and style of your wedding. When selecting the cake design, stick to good taste rules and avoid the excesses. Pick the designer that you feel more close to your requests and helpful in guiding you based on your needs and ideas. It goes without saying that whatever the appearance of the cake you pick, you must make sure first it tastes excellent. 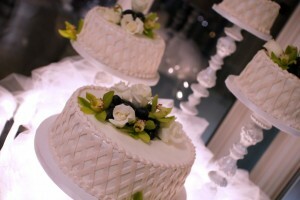 Cake designs could be broadly split into four main categories: The Romantic, The Classical, The Glamour and The Fancy. are certainly the two popular models based on the lightness of the drapes and bows, floral decorations grace, the elegance of the ” stucco “, the tinsel and the scrolls , the magic of nature. is quite clearly linked to fashion and inspired to a combination of bright colours, ribbons, sequins and pearls, drapes and classical reminiscences with minimal patterns. Even the mini cakes can be part of the glamorous category. design ranges infinitely in shapes and colours because it collects all the ideas and inspirations possible in the art of cake design. For example, a fancy wedding cake could be inspired by Alice in Wonderland fairy tale. In some small Italian villages, it is common for the bride and groom to walk to the village square together after the wedding mass. In the square, the family and friends of the couple set up a sawhorse, log, and double-handled ripsaw. The bride and groom must work together to saw the log in half, representing the teamwork it takes to have a successful marriage. In some other regions, the bride and groom shattered a vase or large glass together and the number of pieces were said to represent the number of happy years they would spend together. A more modern tradition is the release of a pair of white doves after the ceremony by the bride and groom to symbolize the couple’s love and happiness. The groom is never allowed to see the bride before the wedding ceremony. Should that happen, this will certainly badly influence the marriage. At the end of the ceremony, the bride, with her back to the invitees, throws her bouquet to the unmarried women who compete to grab it. According to tradition, the one who seize it will be the next and first to get married. A very common tradition, possibly dating back to Roman times, is that the groom carries his bride in arm over the threshold of their home when they first enter it. A month before the wedding, consult with your trusted hairdresser or one specialized in bridal hairstyles for advice on the best combination of hairstyle with your face and your personality. Bring a photo of your wedding dress to create harmony between hairstyle, dress and accessories. For younger brides: Adjust your hairstyle to your dress. If you’re wearing a dress that emphasizes the back, a folded hairstyle is perfect. Otherwise let your hair loose and the hairdresser will hold the veil with hidden clips. For brides young in their heart: surely you’d prefer more sophisticated hairstyle possibly with few, small rhinestones or pearls. The veil can be pinned with a nice clip or a comb. Remember, however, that simplicity always wins. Short Hair: not a problem! Even with short hair you can get hairstyles with a folded effect. If you want a more sophisticated hairstyle, you can always ask your stylist to use hairpieces, which look quite natural today. After the ceremony, in order to avoid spoiling your hairstyle when removing the veil or any other accessory, ask your stylist not to overdo with bobby pins, hair spray and other clips. Always opt for a light make-up. Pre-treat your face with moisturizer suited to your skin and a week before the wedding day, have a facial cleansing to remove all impurities. Trick is to use a light foundation that is not too far from your skin colour. After lying it even on the neck, pass a veil of powder and a light touch of blusher on the cheekbones. An eye anti – bags treatment is recommended a few days in advance. As for the face, do not use strong colours but focus on white or pearl silk effect that will make your eyes brighter. Remove unwanted hairs from the eyebrows and apply water-resistant mascara. Match the lipstick to the eye shadow, perhaps choose opaque pearl as colour but avoid fuchsia, brown or purple. Use a pencil of the same colour as the lipstick to enhance the side of the lips. Hands are the true stars of the day: take care of them with a moisturizer. A day before, book a manicure treatment. Use a transparent or pink or pearly nail varnish. As for the body, you need to feel at ease. Entrust a beautician: a week before the wedding have a scrub, three days in advance undergo a general hair removal: legs, arms, moustache and eyebrows. Two days before, if you are very tense, give yourself a relaxing massage. On your wedding day, take a nice scented bath to refresh the skin, and soften it with a moisturizer of the same scent of the colony. A word of advice: don’t overindulge with the perfume. If you’re getting married in the summer, a light tan will make you look even more radiant.